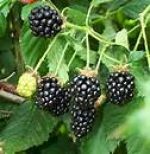 Blackberries are known as the Cabernet of Berries. This soft fruit is popular for use in desserts, jams, and wine. They are rich in fiber and antioxidants and are fabulous mixed with yogurt or as a snack on the go. Sarah's Choice's sweet and juicy flesh has consistently been a winner in our trials. Its flavor, combined with its attractive oval fruits and ideal 3-lb. size, make it the best variety for the home. The Anne raspberry is my personal favorite. The fruit is very large and super sweet. 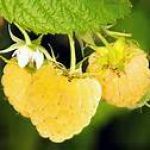 Yellow raspberries are softer than red raspberries and don’t ship well, so they are hard to find in the grocery store. ‘Anne’ is best enjoyed picked fresh from the bush so come over and pick some today! Autumn Bliss- You will love the intense flavor of these red berries! You can small the sweet floral aroma from raspberries as they roll off into your hand. 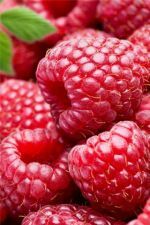 This red raspberry is popular because of its bright red coloring and sweet overripe, flavor when these firm raspberries are fully ripe. Encore- Enjoy velvety, flavorful berries. These are exceptionally sweet raspberries that melt in your mouth! 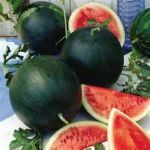 The standard of the icebox melons, Sugar Baby has been a staple at picnics for years. Vines grow to 6 feet and set 4-6 melons roughly 10 inches across. Has that unmistakable crisp, mouthwatering, sweet rich flavor. This popular Italian basil is most often used for making pesto. It has a sweet fragrance and large l More..eaves. 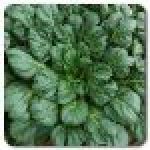 Basil is rich in vitamin K and beta-carotene, natural anti-inflammatory ingredients. Genovese Basil is considered a sign of love in Italy. An old legend says that when a woman put a pot of this herb on her windowsill it was a sign that she was ready to receive a suitor. Another legend says that if a man gives a woman a sprig of sweet basil herbs it means she will fall in love with him forever. Awww, free basil for all my friends! 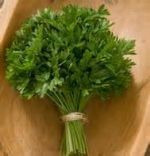 A very leafy plant with small stems and an abundance of roots, cilantro is easily recognized by its More..distinctive characteristic aroma. The flavor is sharp with a strong earthy freshness. Its unique sage-citrus taste delivers a gentle bite to a variety of foods. Large, thick, rounded bulbs. Crisp and flavorful with a nice anise flavor. 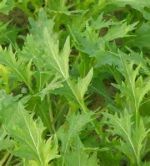 Orion's leaves can be used for salads, or use in eggs, fish and sauces. The thick, rounded bulbs grow above ground and are much larger than older types, and can be steamed, grilled or eaten raw like celery. Outstanding sweet flavor lends itself to many culinary uses. 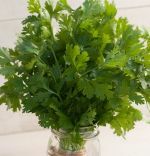 Petite, flat dark green leaves make an attractive fresh garnish. The tangy flavor makes this lettuce a winner in salads. Very uniform loose-leaf type. Standard baby leaf variety for salad mixes that defines this type. 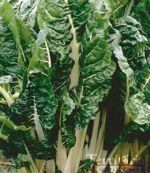 Deeply lobed and frilly, similar to endive with a light pale-green color, oak leaf shape and lofty texture. A wonderfully uniform beet with dark green glossy leaves and round, almost neon colored, 3-4 inch red roots. Merlin really stands out in the flavor department due to its high sugar content. Serve roasted on their own or with other root crops for a dish that will surely warm the body and soul. Leaves make a tasty, nutritious addition to your fall salads. The best all-around red beet. Rapid growth, sweet flavor, and More..More..tenderness are the characteristics of Red Ace. The round, smooth, deep red roots size early, with high uniformity. They maintain their sweet tenderness when larger and older. Sweet, round golden roots are very unique. 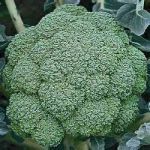 The attractive deep green-leafed tops with contrasting ye More..llow stems are mild-flavored when cooked. The bright gold color that won’t fade after cooking. Mei Qing Choi is also known as Baby Bok Choy. They have smaller heads and they're more tender than the larger variety. Choys have green leaves with a white petiole (leaf vein). They have crunchy stems and slightly crinkled, spinach-like leaves. Bok Choy is usually stir-fried with other ingredients, but it can also be steamed or sautéed and served as a side dish. Bok Choy has gained popularity in the western world for its sweet, succulent nutritious stalks. Mei Qing Choi is a perfect addition to any smoothy because when blended it's not as bitter or earthy as most vegetables. A rugged, vigorous broccoli that offers crisp florets. Big plants with heavy, very firm, dark green, domed heads with a unique "frosted" appearance. The tightly domed, purplish-green heads have small to medium bead size. 'Pacman' produces large 8in heads and loads of smaller, tender heads on side shoots. An excellent performer in our kitchen garden, producing heads with lots of great flavor all summer long. Delicious sauteed in olive oil with Garlic and toasted pine nuts. A perfect little cabbage, weighing in at one pound when 6” in diameter. Another early baby, Gonzales yields attractive, uniform cabbages that look like lustrous, blue-green softballs. 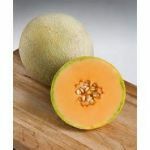 Its dense, firm heads resist splitting and have a particularly sweet flavor and a crisp, crunchy texture. 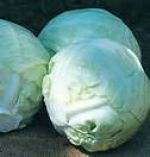 It can be enjoyed in every type of delectable cabbage recipe~fresh and raw in toothsome salads, steamed or baked. These little red cabbages weigh in at only 2-4 lb., making them perfect for those who want smaller portions. The vibrant, red leaves are crunchy, sweet and have a wonderful, mild flavor. Great choice for slaw, stir fry or salads. The finest fresh-eating carrot that is crisp and delicate. This deep orange carrot is tasty as a baby carrot or as 6-8in full size. Rich in Vit A and high sugar content makes this a sweet treat. If you appreciate fresh carrots, you must try this one! Napoli carrots are one of the best tasting veg to pick fresh from your garden. 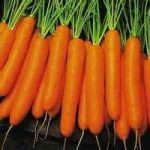 These carrots will not disappoint as it has a lovely sweet flavour with very little core and is a blunt end variety that can reach a length of 15cm. Napoli carrots become incredibly sweet after frost- experience the full flavour of winter "candy carrots." Rated by many as one of the best tasting carrots available, and wonderful as baby roots. This carrot is both tasty and attractive, with a rich, crunchy-sweet bite you will love and a stocky, easy-to-slice shape! A deep orange all the way to the very small core, it is smooth and straight. Higher in vitamins A and B than their store-bought counterparts, home-grown carrots are also rich in calcium and phosphorus -- and they taste delicious! 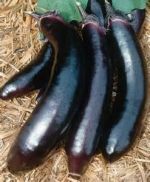 This slender, glossy black Asian eggplant is known for being tender, delicately flavored, and its quick cooking. It is 8 to 10in long and has a thin skin. This versatile eggplant can be enjoyed grilled, roasted, or stir-fried. Siberian- A marbled purple stripe hardneck variety. An easy peeler. Okanogan Blue- A family favorite! Okanogan Blue produces large bulbs. This Rocambole cultivar has lovely bluish-purple striping. Romanian Red- Produces 4-5 cloves on each robust growing bulb. A large-cloved porcelain variety that is easy to peel. A family favorite! If we could only grow one garlic, Romanian Red would be it. Why peel 5 or 6 cloves when, with Romanian, you only have to peel one. Asian Tempest- Grows beautiful scapes, this asiatic cultivar produces 3-5 purple hued cloves per bulb. Large cloved culinary garlic. Inchelium Red-Inchelium Red is a prolific clove producer with a mild garlic taste, even when raw. 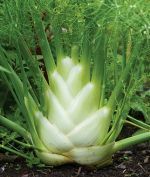 A preferred garlic in many tastings, it is an award winning artichoke cultivar. Very good snap bean. Amazingly easy to pick because the plant holds the beans up-and-out towards the picker and they come off the plant very "E-Z". Astro has a slightly more mild flavor than most arugula varieites. Round leav More..es great for mixing with other salad greens. Sylvetta is also known as Wild Rocket, and has a sharp peppery flavor. 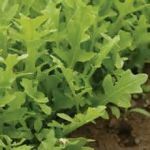 Mizuna is a type of Japanese mustard greens described as having a mild peppery flavor, but less spicy than arugula. The leaves are green and yellow, smooth in texture and somewhat feathery in shape. 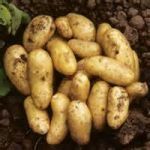 It is available as a mature green or as a baby version that is smaller in size and more tender in texture. Most often used as an ingredient within salads, yet can be used in stir fry or soups. 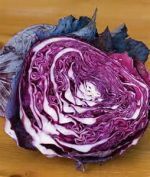 It can also be substituted in recipes for mustard greens or cabbage. In japan, mizuna is pickled and stirred in to rice. Once you taste this variety of Kale, you won't want to try anything else. 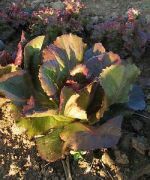 It offers a unique leaf type with extra-dark green, tender noncurled but heavily savoyed leaves. Tuscan kale, like all kales, is extraordinarily nutritious: a cup provides more than 100 percent of the daily value (DV) of vitamins K and A, and 88 percent of the DV for vitamin C.
These Leeks look like large green onions. 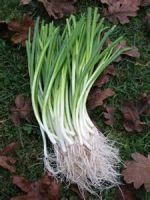 The thick white stalks and slightly bulbous roots of leeks are topped off by broad, flat, green leaves that wrap tightly around each other. 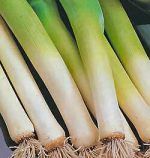 Leeks are actually related to both onions and garlic, and contain a more subtle flavor and fragrance. Raw, they can be thinly sliced and added to salads, relishes, and salsas. 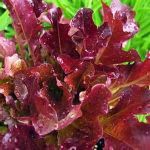 Beautiful maroon tinged leaves help to make an eye-catching salad, with leaves that are crisp and delicious! An heirloom variety commonly used as a baby leaf, but also makes a stunning full-size head. Color More.. varies form a reddish-bronze to deep red on tips and dark green bases. Our best storage onion and the unequaled leader in hard storage types. 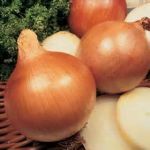 Adapted to long-day areas, it is a medium-sized, round, dark-yellow-skinned onion with ivory flesh. The thin necks dry quickly. In storage trials, Copra was as sound and flavorful in the spring as when freshly harvested in the fall. High in sugar and moderately pungent, Copra makes excellent French onion soup. Treat your family to a delectable fresh garden pea this season with Lincoln, a very high-yielding variety that offers pairs of 4½- to 5-inch pods all up and down its compact stems. Easy to shell and boasting 6 to 9 well-stuffed peas in every pod, it's a family favorite that is perfect for freezing but also delicious when eaten fresh or canned. The Maxigolt are mild, bright, and very sweet. Delicious and high yielding, this is our favourite bush pea. 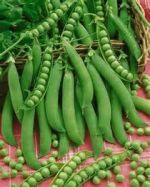 It is an outstanding mid- to late-season variety with large, sweet, dark green peas in attractive, broad, 3-4” pods. Caseload: Pea 'Caseload' boasts exceptional flavor that is slow to turn starchy, allowing for a longer harvest season; nice and sweet! A large, early, green-to-red pepper. The 4 to 5-inch fruits are beautifully blocky and thick-walled and have a sweet fruity flavor. Charlotte potatoes pear shaped with light yellow skin and a creamy yellow flesh. the skin texture is smooth, has a firm texture when cooked, and has a first class flavour. It has been awarded the RHS Award of Garden Merit. 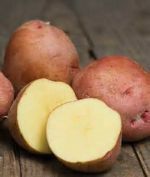 This variety is excellent for boiling and salad use including making delicious potato salad! 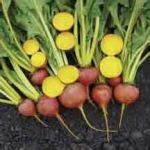 Cherriette- These round bright red radishes have a crisp mild flavor; Sliced open, it is firm with a white interior. These radishes grow 2-inches in diameter. Dense with a sweet/hot taste. 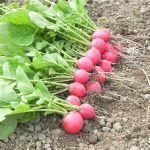 Traditional variety from Southern France- the best non-hybrid French Breakfast type radish. At only 3-4in. 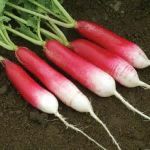 this bold redroot with gorgeous white tip, has a pleasing mild flavor and crunchy texture. Perfect for early spring salads. This variety is considered by some to be the best flavored rhubarb available with a perfect sweet, tart combination that makes rhubarb so appealing. The stalks will grow about two feet tall and produce good yields of fleshy stalks that are not stringy. My favorite green onion on the farm. Dependably produces beautiful bunches of green onions. Upright growth with no flopping, vigorous & easy to clean. So perfect that you don't even need to cut the tops off. Bright green leaves & white bottoms are tall yet stocky. The dark green, smooth, upright leaves of this spinach are easy to clean. Use it fresh or cooked, and it freezes well, too. Unlike most spinach, it can be planted in spring, summer and fall, providing three seasons of eating pleasure. Our favorite fall vegetable! With its sweet, creamy, dark-orange flesh, butternut squash is one of the best and most versatile of all the fall squashes It can be roasted, toasted, puréed for soups, or mashed and used in casseroles, breads, and muffins. A dark glossy green, deeply savoyed that is More..perfect for use in salad mixes or steamed. This is a sweet Swiss chard with beautiful candy apple red stalks and dark green, crinkly leaves with touches of red veins running through. These leafy greens are valued for their mild flavor and high nutritional value. They can be eaten raw or the green leaves can be prepared in same manner as spinach and the stalks can be prepared like asparagus. Unique Asian green. 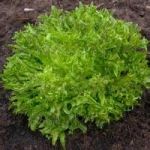 Can be harvested small for salad mix or as a large rosette. Spoon shaped thick dark leaves make beautiful compact rosettes with mild brassica flavor. Cooks and tastes like spinach. Good st More..ir-fried and in soups. Taste that tops the charts! This medium-sized, avg. 4-6 oz. 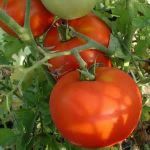 tomato offers a rich, full flavor for sandwiches and salads early in the summer. New Girl ripens faster and resists over-ripening better than most varieties. 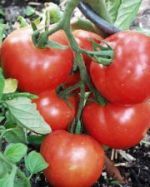 The snow white cherry tomato has a sweet, fruity flavor with a real tomatoey aftertaste. 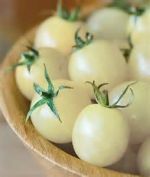 Pale yellow to ivory 1 ounce fruits makes them a striking color addition to cherry tomato mixes and salads. Hakurei are relatively new turnips that were developed in Japan in the ’50s. Their surprisingly delicate, almost fruity flavor and crunchy texture accounts for their popularity. They’re delicious raw, but if you can resist the urge to simply pop them in your mouth, try shaving them into salads or slaws along with thinly sliced apples or pears. When cooked, they develop a buttery flavor and when roasted at high temperatures, their sweetness increases. The turnip tops are also tasty quickly sautéed with garlic in olive oil. 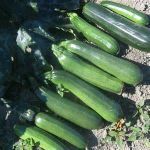 The most popular variety, the Elite zucchini are long, straight zucchinis with medium-green, glossy skin. Excellent freezing and canning zucchini squash. Generally harvested at 7-8in.